Anthony Perkins was born in New York City on April 4, 1932. The son of actor Osgood Perkins, he attended Rollins College in Winter Park, Florida before setting his sights on a film career by heading west to Los Angeles. Perkins' film debut was 1953's Ruth Gordon-penned comedy The Actress - where Anthony co-starred alongside Spencer Tracy. By the late 1950s, Perkins saw consistent work in a variety of fare including the notable Fear Strikes Out (1957) and Stanley Kramer's apocalyptic On the Beach (1959). But the following year would effectively redirect Perkins' fate entirely when he starred in Alfred Hitchcock's PSYCHO. As shy motel owner Norman Bates, Perkins perfectly captured the subtle twitchery that would come to personify one of the horror genre's most memorable onscreen killers. 1968's wholly unique horror/thriller Pretty Poison found Perkins as a confused pyromaniac alongside a deceptively malevolent (and perfectly cast) Tuesday Weld. After appearing in Joseph Heller's critically acclaimed Catch-22, Perkins began the 1970s on the right note with the adept TV horror How Awful About Allan directed by Curtis Harrington. The actor worked steadily throughout the '70s, including 1975's Diana Ross vanity piece Mahogany, as well as 1979's sci-fi opus The Black Hole. After a near quarter century hiatus (and with Hitchcock's own passing), Perkins returned to the Bates house on the hill with 1983's PSYCHO II directed by Richard Franklin (1978's Patrick). Having spent the past twenty odd years in a mental asylum, Norman Bates is declared sane and released from the institution to begin a new life in the free world. But soon, Norman feels the watching eyes of his Mother...and meanwhile, someone has begun to kill anew. Could fragile Norman be losing his grip once again? Surely it's debatable whether PSYCHO ever needed to become fodder for franchise hell, but it's clear in retrospect that Perkins brought a much needed vibe of class (and black comedy expertise) to the subsequent sequels, including his directorial bow with 1986's PSYCHO III. Perkins continued working for the next half decade in a variety of terror fare, most notably 1989's Edge of Sanity and 1990's lackluster PSYCHO IV: The Beginning (made for television). 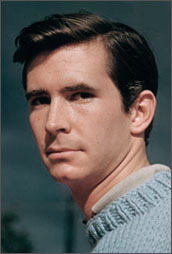 Anthony Perkins died in September of 1992. Tragically, his widow Berry Berenson was killed in the terrorist attacks of September 11, 2001 aboard one of the passenger jetliners deliberately crashed into the World Trade Center. The two are survived by sons Elvis and Osgood.